Recovery Toolbox for DWG (Download) has an extremely simple and straightforward interface that completely rules out the possibility of a mistake. You don't need any special knowledge or prior recovery experience to successfully restore data from a damaged AutoCAD DWG file. All you need to do is to follow on-screen instructions and make the necessary selections where needed. Despite the remarkable simplicity of the program, we have created this usage manual to help you use the program more efficiently. Please read it attentively before contacting our technical support department - your question may have already been answered in this document. If you, however, have problems with the program, please don't hesitate to contact us - we will be glad to assist you. 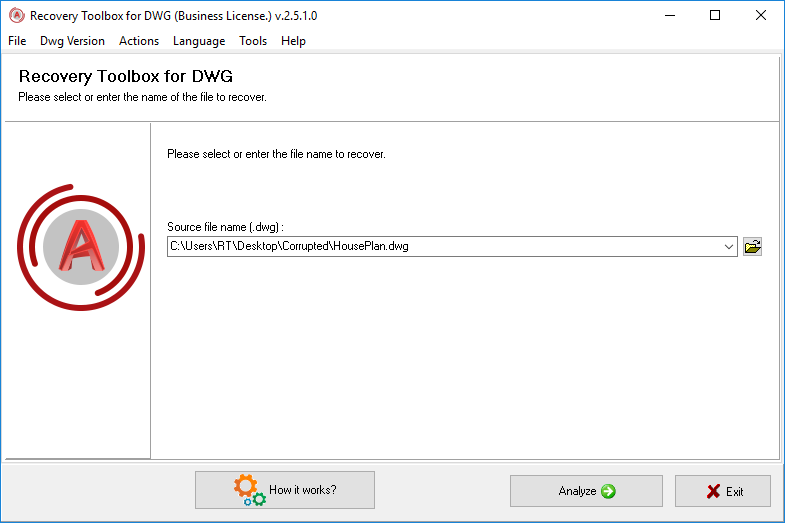 If the DWG file you are working with was damaged very seriously and Recovery Toolbox for DWG cannot restore any data automatically, don't hesitate to use the Send source file command from the main menu to email the file to us. We will analyze the structure of the file and will attempt to recover your data manually using our in-house tools and data recovery experience. We will also use this opportunity to improve the data recovery algorithms used by Recovery Toolbox for DWG. Please note that you do not need AutoCAD to be installed on your computer to analyze damaged files and preview their contents, so you can do this on any PC. You will only need AutoCAD for the final data export operation. 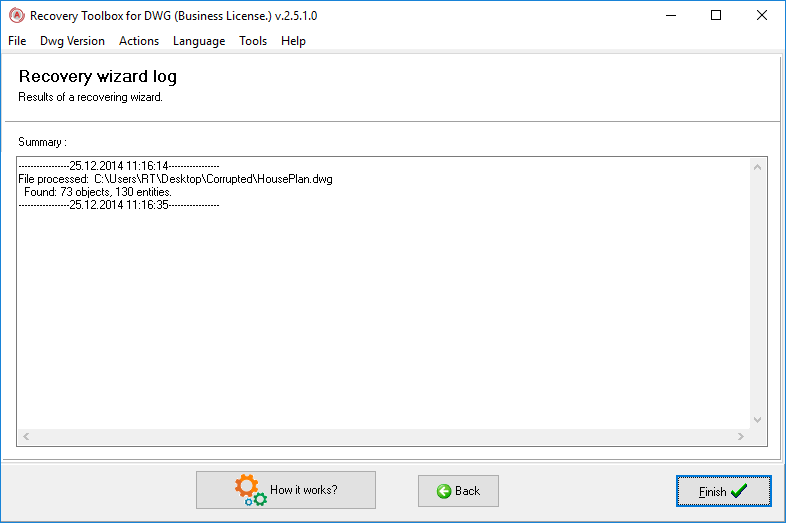 The first step of the recovery process enables you to select a damaged DWG file you want to restore data from. This can be done in several ways. To select a damaged file, type its name and path into the input field located in the center of the program window or use the standard Windows open file dialog. You can also select one of the previously used files from the dropdown list that can be opened by clicking a small button with a downward arrow in the right part of the input field. Once you've entered the name of the file, you can proceed to the next step by clicking the Analyze button at the bottom of the window. By default, the program used the Auto Detect option. At this stage, the program performs the analysis of the structure of the damaged file and attempts to identify recoverable elements within it. Please note that the process may take considerable time depending on the size of the file being processed and the speed of your CPU. At this stage, no menu items are active and you can only terminate the process and either go back to Step 1 ( Cancel) or exit the program altogether by clicking Exit. Since the analysis may take considerable time, you can minimize the program window to attend to other tasks. Once the process is over, the program will bring the recovery dialog back to the front of your desktop. Once the analysis is over, you will see the content of your DWG file in the program window. 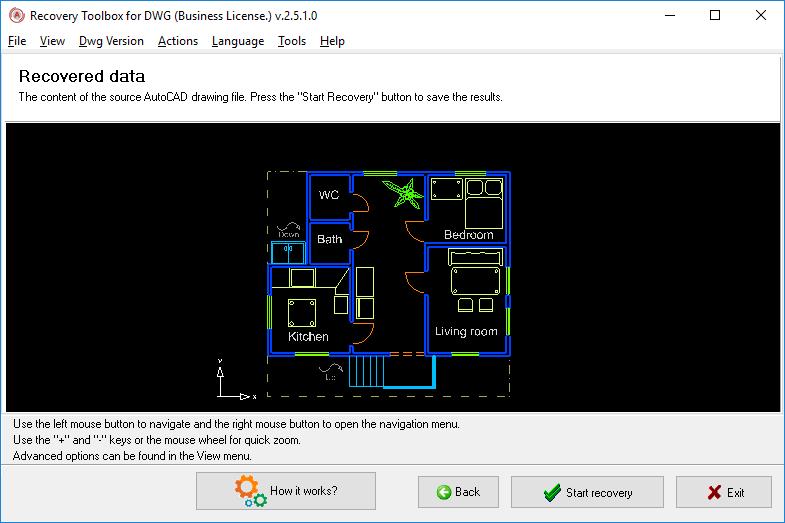 Recovery Toolbox for DWG allows you to move and rotate the drawing, as well as zoom in and out using the keyboard and/or mouse buttons. Press and hold the left mouse key to move, rotate and zoom depending on the selected mode. The right mouse button brings up a popup menu that lets you select one of the three available modes: Move, Rotate and Zoom. Plus (+) and minus (-) buttons are used for quick zooming. The mouse wheel can also be used for controlling the quick zoom function. To proceed to the next step of the recovery process, click Start recovery. 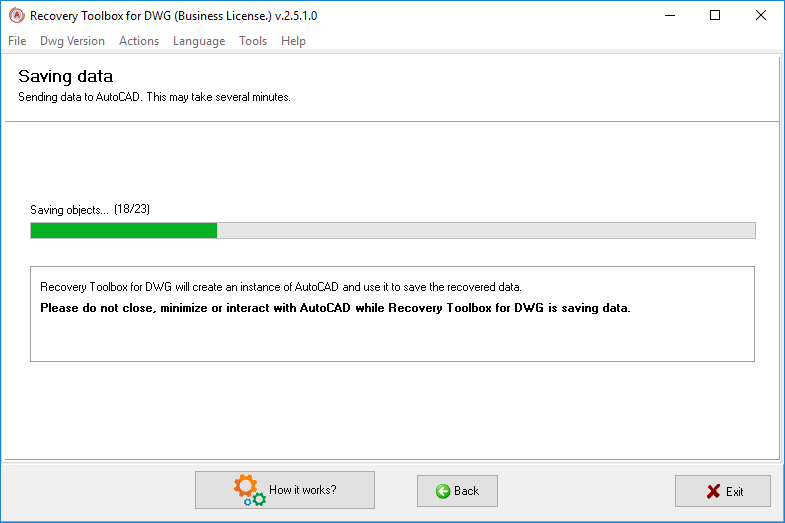 Recovery Toolbox for DWG does not save recovered DWG files, but passes the recovered data to AutoCAD, which means that you must have AutoCAD installed on your computer at the time of recovery. If you don't have any AutoCAD versions installed, you will see a corresponding notification. If, however, you have several versions of AutoCAD installed, the program will ask you to choose the one the recovered data will be sent to. There is no strict requirement to select the exact same version of AutoCAD your file was created in. Note, however, that exporting a newer DWG file to an older version of AutoCAD may result in some properties or attributes getting lost. For instance, you won't be able to export a 32-bit true color value created in AutoCAD 2004 to AutoCAD 2000 - the original value will be lost and the program will replace it with its closest match. Once you have selected the necessary version of AutoCAD and clicked Next, the program attempts to launch AutoCAD and pass the data to it. If this attempt fails for some reason, you will see a corresponding notification and will be prompted to select another version. If you have only one installation of AutoCAD, the program will suggest checking its integrity. If the software managed to start AutoCAD and connect to it, it immediately starts exporting the recovered data. You will see an AutoCAD window on your desktop. It is highly recommended NOT TO CLOSE, MINIMIZE, MAXIMIZE OR IN ANY OTHER WAY INTERACT WITH AUTOCAD during this process, since it may terminate the data export process. You will see objects appearing in the AutoCAD windows and will be able to track the overall process using the progress bar in Recovery Toolbox for DWG. At the final stage of the process, the program shows a log file with detailed statistics on the actions performed and objects restored, as well as any errors that may have occurred. At this stage, you can either close the program by clicking Finish or go back to the file selection step and select another file using the Back button at the bottom of the program window. The corrupt Autocad recovey program initializes its graphics engine before starting the analysis of the file structure. If it fails to initialize the graphics subsystem, it will show a corresponding notification. In this case, we recommend immediately updating your video card drivers. Another error may occur when the user tries to send a damaged DWG file to the developers of the program. If you see this error message, check whether you have an email client installed and if you do, make sure you have a configured email account in it. Note: the program can only recover files of the AutoCAD version 15 (AutoCAD 2000) and higher. The program does not recover AutoCAD data files of earlier versions.